Unbelievably easy slow cooker pulled pork – flavorful, tender, and only requires 5 minutes of your time! Typically, I am the type of person that loves nothing more than to fire up the grill during the hot summer months to avoid turning on the oven at all costs. My whole anti-oven-in-the-summer philosophy sort of changed the last two weeks though, when Chicago (and the rest of the country, it seems) turned into a terrarium. With temps over 100, and humidity percentages as high as 80+ percent, the thought of going outside to grill didn’t even sound fun anymore! I’m probably preachin’ to the choir, because I have a sneaking suspicion that most of you dealt with something very similar. Last week’s heat was the kind that made it difficult to breath, ya know? I walked outside to water my plants at 8:00 in the morning one day, and broke a sweat in the 5 minutes it took to nourish my poor thirsty plants! This recipe requires literally 5 minutes of your time. You just plop a few ingredients in the slow cooker, walk away, and about 8 hours later you’ve got yourself a meal that is SO tasty, people will think you spent hours preparing it. Variations of this recipe are all over the web. Some call for covering the meat with Coke, but I love using Root Beer. Use whatever you have on hand. 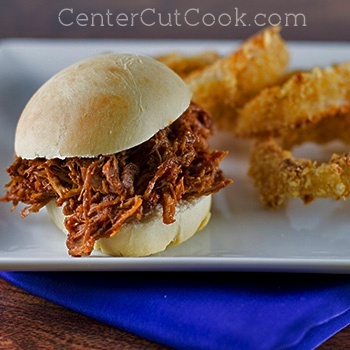 I served the pulled pork on homemade hamburger buns (recipe coming tomorrow! ), and made these delicious Crispy Baked Onion Rings to go with it! Prepare the shoulder roast by poking it with a fork several times. Sprinkle the roast with salt, pepper, and garlic powder and gently press the seasonings into the roast. Place the seasoned roast in the slow cooker and place the sliced onion on top. Pour the root beer over the roast. Cook on low for around 8 hours. Carefully remove the roast after it’s cooked. Discard the bone if you used a shoulder roast. Use two forks to shred the meat. Discard the liquid from the slow cooker. Return the shredded meat to the slow cooker. Add in 18 ounces of your favorite bbq sauce and cook on low for an additional hour. Serve on fresh toasted buns.